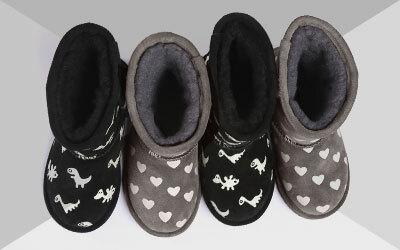 Designed for the little lambs in the family, the EMU Australia Lamb Walker is soft and comfortable. Perfect for toddlers and first walkers, Australian Merino wool keep feet warm, while a soft flexible sole offers support. Cute and comfortable, the Little Creatures Lamb Walkers are toddler booties featuring soft Australian Merino wool inside and out to keep feet warm and snug. Designed with new walkers in mind, the Lamb is built on a flexible moulded rubber sole which allows a greater freedom of movement and grippy traction.